Here’s an elegant sipper that is easy to make but big to impress. 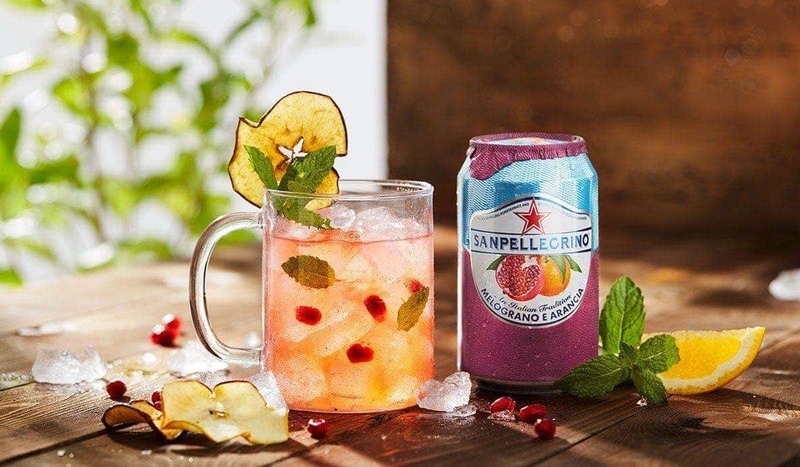 A lovely rose tinted mocktail topped with Sanpellegrino Melograno e Arancia, the Mellow Melograno is a bursting bouquet of fresh fruit that will fast track you to relaxation mode whenever life gets frantic. Bright and pleasantly tart, and the right balance of sweet and bitter – the way that life itself can be. One sip of the Mellow Melograno will have you thinking that exactly, whilst the second sip will delight you with its pretty flavors of pomegranate, apple and grapefruit with just the right touch of fresh orange notes coming from Sanpellegrino Melograno e Arancia. Let Mellow Melograno accompany you through your day, or even better, mix it up with a tuna tartare or an orange salad on the side, and make happy times come your way! Fill a large, sturdy glass (14 oz capacity), with ice cubes. Pour all the juice and top up with Sanpellegrino Melograno e Arancia. Combine well by stirring gently with a bar spoon. Garnish with fresh mint and a dehydrated apple wheel. If you are 21 years old or over you can turn the Mellow Melograno into an alcoholic drink by adding 1 oz of chili vodka.